Australia is one of those countries that offer an abundance of sights and activities to suit any traveler. If you are considering a trip to this beautiful country, there is no doubt that you’ll be kept busy during your entire stay. Following is list of the top 5 sights in Australia to help you plan your vacation. The Great Barrier Reef, located off the coast of Queensland in the North-Eastern part of Australia, is definitely worth a visit. 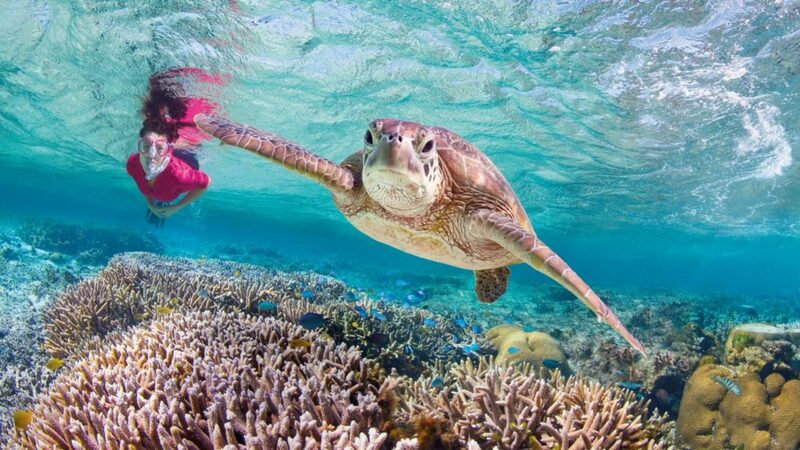 The largest coral reef in the world, the Great Barrier Reef is one of Australia’s most amazing natural wonders. At about 2300 km long, the reef is home to many species of colorful fish, starfish, dolphins, turtles, sharks and of course, corals. Thousands of reefs and islands of both hard and soft corals make up The Great Barrier Reef, one of the Seven Wonders of the World. It is larger than The Great Wall of China and is the only living thing on the planet that is visible from outer space. Visiting Sydney and not taking the time to enjoy the spectacular sight of the city illuminated at night is simply not an option. Sydney Harbour Bridge, built way back in 1932, is an iconic structure in the city that provides visitors with a magnificent, 360-degree view of what some consider to be the greatest harbor in the world. Night time views of Sydney Harbour with the city lights reflected in the water is absolutely breathtaking and sure to leave magical images imprinted in your mind forever. Situated off Australia’s eastern Queensland coast and stretching for a distance of more than 120 km, Fraser Island is the largest sand island in the world. Visiting the island gives you the opportunity to see The Cathedrals, the imposing cliffs that stand proudly behind the sandy-colored beach. Fraser Island is also home to Indian Head, a rocky outcrop on the easternmost tip of the island. An eco-tourism destination, Fraser Island, with its beaches, lakes and freshwater pools, is definitely one of the top 5 sights in Australia. The world-famous Great Ocean Road, one of the many wonders of Australia, is well-worth a visit. Driving along this 150-mile stretch of road is truly a memorable experience. At the end of the drive, you are rewarded with stunning views of the Twelve Apostles, tall pillars of resilient rocks emerging from the sea just off the coastline. Their formation came about from the Southern Ocean constantly gnawing away at the limestone cliffs over the years. It is a strange yet incredibly beautiful sight in Australia that shouldn’t be missed. More than likely one of the most famous natural landmarks in Australia, Uluru, more commonly known as Ayers Rock, is an enormous sandstone monolith that stands in the western area of the Simpson Desert, a short distance away from the “Red Center” of the country. According to studies conducted, the rock was created over a period of more than 600 million years. Although named Ayers Rock in 1873 after Sir Henry Ayers, Uluru – its official name, was given to the structure by the Aborigines who have lived in the area for the past 10,000 years. These are considered by many to be the top 5 sights in Australia. There are, however, countless more to choose from to visit and explore during your stay.